Whimsical yet weighty, attractive and modern; the Blok Concrete Round Table – available in two great sizes – is the perfect choice for contemporary casual dining! 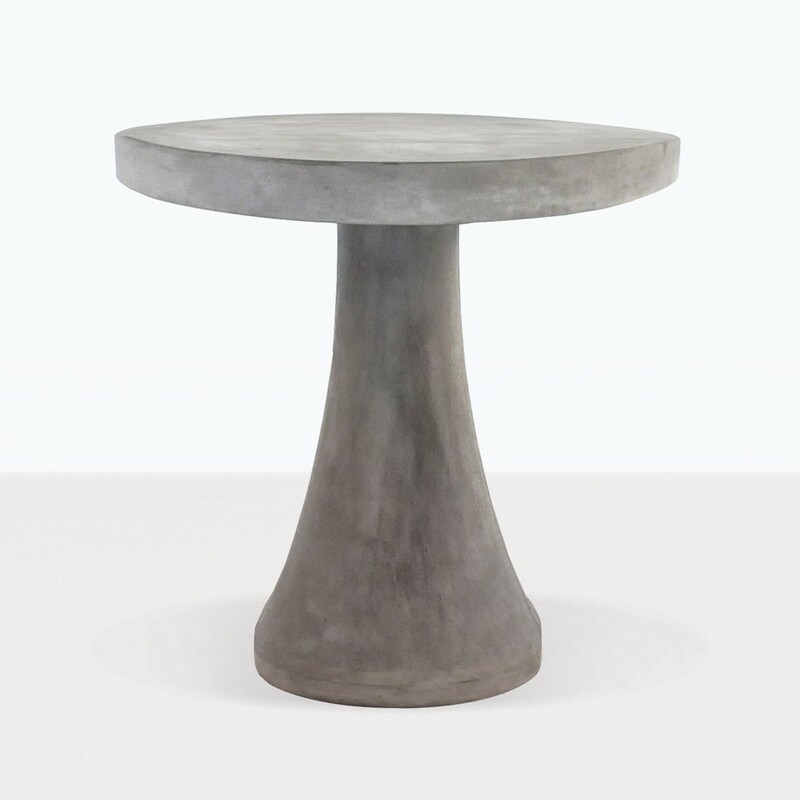 Designed to exemplify modern living, the Blok Concrete Round Table features a thick round top and a flared pedestal which resembles a game piece! These Blok Concrete Round Tables have become a popular choice for the smaller patio or modest balcony and we have even sold them for indoors as well! Use it as a focus point in your foyer or for an intimate dining setting outdoors. Made of an amazing Raw Concrete composite of fiberglass and resin, which is infinitely stronger and longer lasting than 100% concrete, while being lighter and still retaining the essence of concrete! And since concrete is a porous material, susceptible to absorption and staining from strong oils or colored liquids. Our raw concrete has a light sealant throughout, but more can be applied if you would like to preserve the color of your table. And, as with any table, we recommend wiping it down after use. 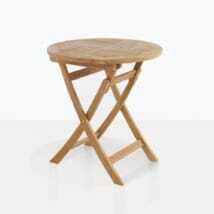 At Teak Warehouse we carry plenty of options so you can choose product lines and materials that will suit you! As well as raw concrete composite, we are happy to host #316 Stainless Steel, A-Grade Teak, Reclaimed Teak, Viro® All Weather Wicker, Sunbrella® and Batyline® and Textaline® mesh fabrics. If that weren’t enough to whet your designer palate, be excited by the loungers, deep seating, benches, accessories, umbrellas, planters, dining sets and much, much more. Our new, updated website has sizes, pictures and prices, and if there’s anything else you need to know, call us! We are available everyday to discuss all your options. 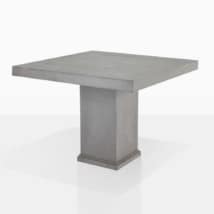 Choose from our 32″ or 40″ wide Blok Concrete Round Table depending on how much space you have. 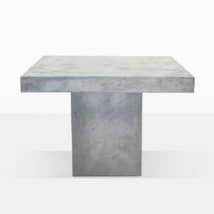 Teak Warehouse uses a composite of concrete, fiberglass and resin to create our extensive range of raw dining tables, resulting in beautiful items that look, feel, and act like concrete but are not nearly as heavy and have a much longer, stronger life span! 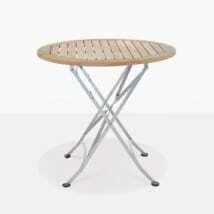 This table comes in 2 sizes, choose an option below for more information. Pieces are sold separately. Feel free to call us for extra information on our wide range of products. This Blok Concrete Round Table suits contemporary or classic living spaces depending on the chair you pair with it. Place in the middle of your garden and offset the concrete with some teak or wicker chairs. For a more traditional look, place 4 chunky Teak Side Chairs around the table, creating a sense of stability within your outdoor setting. If it’s modern flavor you’re after, then try out our Batyline® stackers, a marvelous mix of Stainless Steel, mesh, bringing an industrial element to your space. Place two or three of these in different size options to fill in a park setting; an idyllic space for families to lunch. The Blok Concrete Round Table suits a whole manner of areas, from residential to commercial. Enjoy the splendid earthy contemporary vibe!